The exponential increase in data storage requirements over the last decade or so has been handled by regular increases in hard drive capacities. Multiple HDD vendors supply them to cloud providers (who get the main benefits from advancements in hard drive technologies), but, Seagate is the only one to also focus on the home consumer / prosumer market. In the last three generations, we have seen that Seagate has been the first to target the desktop storage market with their highest capacity drives. The 10 TB BarraCuda Pro was released in Q3 2016, and the 12 TB version in Q4 2017. Seagate is launching the 14 TB version today. The Seagate BarraCuda Pro 14TB is a 7200RPM SATAIII (6 Gbps) hard drive with a 256MB multi-segmented DRAM cache. It features eight PMR platters with a 1077 Gb/in2 areal density in a sealed enclosure filled with helium. The main change compared to the 12TB version introduced last year is the usage of Seagate's second-generation two-dimensional magnetic recording (TDMR) heads, allowing for higher areal density (1077 Gb/in2 vs. 923 Gb/in2 without TDMR). If you are curious about how TDMR enables this, we have a brief explanation towards the end of this review. According to Seagate, the 14TB BarraCuda Pro typically draws around 6.9W, making it one of the most power efficient high-capacity 3.5" hard drives in the market. It targets creative professionals with high-performance desktops, home servers and/or direct-attached storage units. It is meant for 24x7 usage (unlike traditional desktop-class hard drives) and carries a workload rating of 300TB/year, backed by a 5-year warranty. The drive also comes with a bundled data-recovery service (available for 2 years from date of purchase). The various aspects of the drive are summarized in the table below. 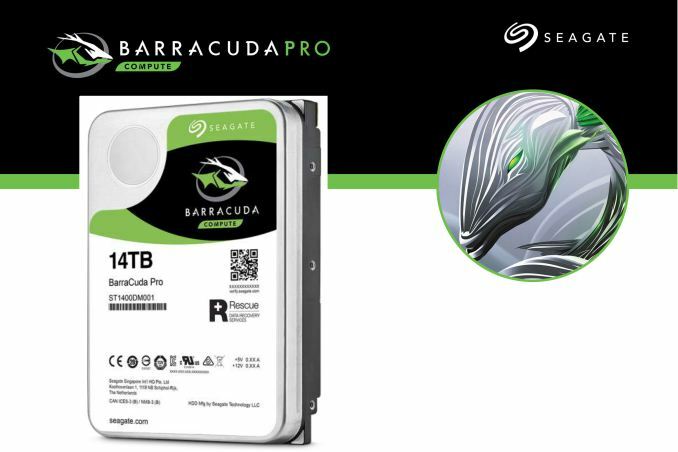 With the launch of the 14TB BarraCuda Pro, Seagate has also updated the model numbers for the other capacities in the series. While performance numbers remain relatively unchanged, capacities 10TB and up come in at 690g, while the 8TB is at 650g. The 6TB, however, is at 780g, pointing to different number of platters for different capacities, and even non-helium technology for the smaller ones. A high-level overview of the various supported SATA features is provided by HD Tune Pro. The main focus of our evaluation is the performance of the HDD as an internal disk drive in a PC. The other suggested use-case for the BarraCuda Pro is in direct-attached storage devices. The evaluation in these two modes was done with the help of our direct-attached storage testbed. 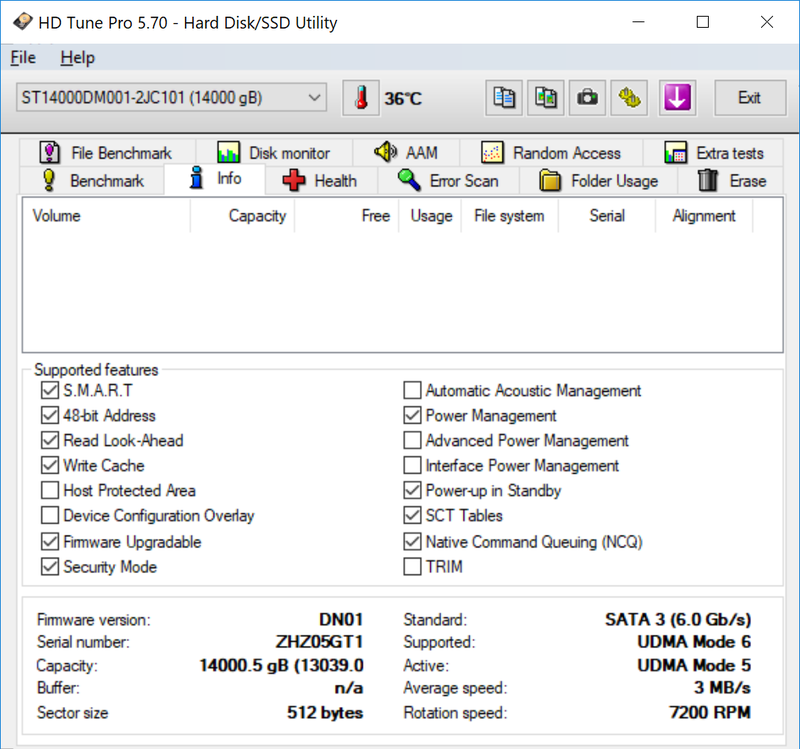 The internal drive scenario was tested by connecting the drive to one of the SATA ports off the PCH, while the Akitio Thunder3 Duo Pro was used for evaluating the performance in a DAS. The Thunder3 Duo Pro was connected to one of our testbed's Thunderbolt 3 Type-C port. The controller itself connects to the Z170 PCH via a PCIe 3.0 x4 link. The full details of the reasoning behind choosing the above build components can be found here. Mostly cost, although once you get into 40TB raid land I suspect the convenience of >10TB drives outweighs the issue of buying multiple 8 port SATA pci-e cards to go along with 16 3TB drives. The 3TB still wins in cost (although any more and I'd look into jumping to 4TB, the cost of the ports outweighs the cost of the parity drives) and you can also bump up to RAID 6. On second thought, I'm not sure how I'm going to wrap a case around 16 drives: that might be the biggest hurdle. Not that I'm convinced that RAID6 is necessary (as far as I can tell most "you need RAID6" assumed that bad bits were randomly dispersed and that a single bad bit would kill your data, actually bad bits have to be in 4k(byte) chunks (32,000 times as rare as they thought) and that at least consumers aren't going to store anything that can't afford a single [sector] of error (at least at 40TB level). But If I'm already buying 15 hard drives for RAID5, I'll bump it up to RAID6. It's not related to cost. Someone just knows RAID used to be a buzzword and he has to slip into the conversation to add weight to some dubious opinions. RAID 5 and 6 don't protect from data corruption, just dataloss. ZFS has an custom implementation of RAID 5 and 6 that can detect corruption and figure out which source has an uncorrupted version. Somehow I don't think I'm building a >40TB array with anything but ZFS (plus its own RAID). RAID is overblown and I'd expect more failures from things other than drives self-bricking. RAID's best feature is probably for yanking a drive due to SMART failures or aging out of an array. You'd have to take down a JBOD array to image a new drive from the one aged out. I wouldn't expect you to want to use the data from a drive yanked due to SMART failures. If you are just going to "build and forget" the array, RAID isn't buying you much. Im running 2 12 TB not in RAID. Just using one of them as backup. Much safer than a RAID.